Chef-TV personality Gordon Ramsay has opened his Gordon Ramsay Hell’s Kitchen at Caesars Palace. 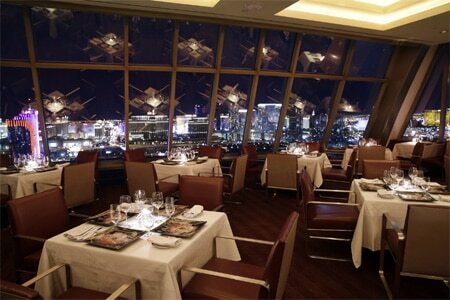 The restaurant is Ramsay’s fifth in Las Vegas, all of which are located in Caesars Entertainment properties. At the centerpiece of the setting is the kitchen, and it is visible from every seat in the dining room. The newcomer accommodates nearly 300 guests indoors and on a Strip-adjacent patio. A daily themed lunch, dinner and bar menu comprise Hell’s Kitchen cast/chef recipes and dishes featured on the show, including many of Ramsay’s signature creations. 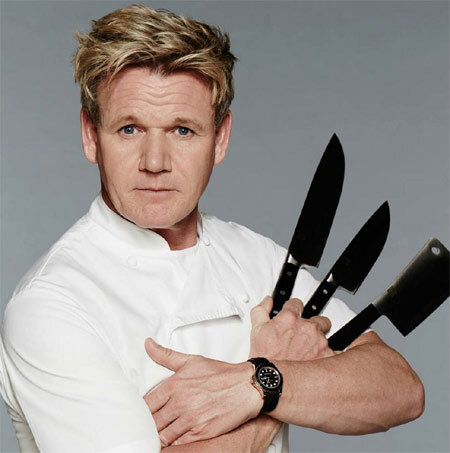 Gordon Ramsay Hell's Kitchen, Caesars Palace, 3570 Las Vegas Blvd. S., Las Vegas, NV 89109, 702-731-7373. Black Tap Craft Burgers & Beer has opened at The Venetian, in the former home of B&B Burger & Beer near the poker room and sports book. Black Tap spent an estimated $3 million in construction costs, and the décor features retro neon graphics, such as boomboxes, cassette tapes and old-style cameras, along with subway tile walls. The word “Shake” has been inlaid in a custom-designed mosaic floor. The menu is highlighted by nine craft burgers, such as The Mexico City burger with a prime burger, pepperjack cheese, pickled jalapeños and crispy onion ring; and The Greg Norman with Wagyu beef, house buttermilk-dill, blue cheese and arugula. The restaurant also features the CrazyShake Bar, where customers can watch employees mix up one of the eight shake creations, such as Cotton Candy, a strawberry shake with a blue and pink pearl chocolate rim, a pink lollipop, rock candy, whipped cream and cotton candy. Lunch & Dinner daily. Black Tap Craft Burgers & Beer, The Venetian, 3355 Las Vegas Blvd. S., Las Vegas, NV 89109, 702-414-2337. Palms Casino Resort has opened A.Y.C.E. (All You Can Eat) Buffet. The design features communal tables, checkered stained-glass windows and plaid carpets. Seven food stations are based on cooking methods: The Greenery with fruits, seasonal salads and Italian antipasto; The Hearth centered around a brick oven creating casseroles, cedar plank salmon and pizzas; The Roastery with a 900-degree grill churning out oxtail poutine, grilled calamari steaks and quesadillas; The World Pan with preparation done on a wok, with paella, bao buns and gumbo; Smoke & Fire with smoky nuance added to bourbon-glazed ham, barbeque ribs and smoked brisket Benedict; The Revival focusing on healthy foods and vegan and vegetarian cuisine with fresh pressed juices, crispy eggplant “bacon” and quinoa grits; and Sweet & Light with fruit cobblers, freshly baked cookies, croissants and a gelato bar. A.Y.C.E. is open daily for breakfast, lunch and dinner and offers a Bottomless Mimosa Brunch on Sundays. A.Y.C.E. Buffet, Palms Casino Resort, 4321 W. Flamingo Rd., Las Vegas, NV 89103, 702-942-7777, 866-942-7777. In celebration of Chinese New Year, Hakkasan at MGM Grand will offer a signature menu using ingredients believed to bring good luck and prosperity for the coming year. Available from January 29 to February 28 and priced at $118 per person, the menu includes small eats of Szechuan oyster with lotus root and crispy rice in mantau; braised beef tongue with caramelized walnut, asparagus and mint; and crispy scallop in sweet plum sauce with mango. Main dishes are baked Chilean sea bass with kumquat glaze, abalone fried rice in bean curd wrap with Chinese sausage and shiitake mushroom, wok-fry lobster with edamame and caviar and Rhug Estate organic lamb in seaweed soy with celery and enoki mushroom. Dessert is Golden Fortune with ginger caramel, roasted macadamia nuts and lemongrass. Guests will be invited to write their wishes on red ribbons that will be hung around the restaurant. Hakkasan, MGM Grand Hotel & Casino, 3799 Las Vegas Blvd. S., Las Vegas, NV 89109, 702-891-7888. Grimaldi’s is offering its winter menu through the end of February. On the seasonal menu are rosemary potato pizza, a classic white topped with thinly sliced rosemary potatoes and diced pancetta; spinach pecan salad with dried cherries, red onions and crumbled goat cheese tossed in house dressing; and two made-from-scratch cheesecake offerings: Reese’s peanut butter cup and butterscotch toffee. Complementing the fare are the Cherry Pie Three Vineyards Pinot Noir, a 100 percent Pinot Noir varietal selected from Monterey County, Sonoma Coast and Santa Barbara County; an Italian “75” cocktail with Square One Bergamot Vodka, blood orange purée and lemon juice topped with La Marca Prosecco; and a “Mocha” Martini with Chopin Vodka, Dorda Chocolate Liqueur, Galliano Ristretto and half & half. Grimaldi’s has five Southern Nevada locations: in Henderson at Eastern and Richmar, inside The Palazzo, in the Fashion Show Mall, on South Rainbow and in the Boca Fashion Village. Grimaldi’s, Boca Park, 750 S. Rampart Blvd., Las Vegas, NV 89145, 702-479-1351. Hamptons at Tivoli Village is hosting Wine Therapy Wednesdays with wine and food specials available all day long. Offered are $5 by-the-glass mimosas, sangrías and select wines; and $20 bottles, which includes the option to purchase bruschetta for an additional $5 and wine board with assorted meats and cheeses with honeycomb, nuts, pickled vegetables, grain mustard and dried fruit for an additional $10. Hamptons, Tivoli Village, 440 S. Rampart Blvd., Ste. 180, Las Vegas, NV 89145, 702-916-1482. Tom Colicchio’s Heritage Steak at The Mirage is serving a Sunday dinner roast tasting menu priced at $85 per person. Served weekly, the dinner includes Tuscan kale salad with warm bacon vinaigrette, breaded egg, feta and pickled shallot; “English cut” roast sirloin strip with Yorkshire pudding and smoked beef jus; sides of Grandma’s mushroom ‘slaw,’ sweet potato balsamic onion rosti and Heritage corn casserole; and dessert of ice cream social: vanilla bar, ice cream, chocolate dipping sauce and classic toppings. A wine pairing is available for an additional $35 per person. Tom Colicchio’s Heritage Steak, The Mirage, 3400 Las Vegas Blvd. S., Las Vegas, NV 89109, 702-791-7330. In honor of National Slow Cooking Month, Rí Rá Irish Pub at The Shoppes at Mandalay Place will offer three hearty stews from Monday, January 22, through Sunday, January 28. Priced at $15, the stews include beef and Guinness featuring tender Guinness-stewed beef with root vegetables and barley, topped with a dollop of pub mashed potato and served with Irish brown bread; lamb stew with savory slow-cooked lamb, root vegetables, barley and Harp gravy, served with Irish brown bread; and Ballycotton fish stew loaded with haddock, salmon, mussels, crab, fennel, corn, potatoes and a saffron broth, served with a toasted baguette. Guests wishing to try all three can sample a flight of smaller sized stews for $15. Rí Rá Irish Pub, Mandalay Bay Resort & Casino, The Shoppes at Mandalay Place, 3930 Las Vegas Blvd. S., Las Vegas, NV 89119, 702-632-7771. Scott Simon has been appointed executive chef at Carson Kitchen, replacing John Courtney, who reportedly left on amicable terms. Scott is the brother of the late Kerry Simon, who opened the restaurant and passed away in 2015 after battling multiple system atrophy. A native of Chicago, Scott worked with his brother in Miami and South Beach, and moved to Las Vegas in 2002 and worked alongside Kerry at Simon Kitchen and Bar at the Hard Rock, Cathouse at the Luxor and the Simon Restaurant and Lounge at Palms Place, and also consulted on other projects with Kerry such as Simon Kitchen + Bar in Palm Springs and Simon Mansion in Punta Cana. In 2013 Scott returned to his hometown to open Chuck’s: A Kerry Simon Kitchen in the Chicago Hard Rock Hotel, where he was executive chef until its recent closure as part of the hotel’s rebranding. Carson Kitchen, John E. Carson Building, 124 6th St., Ste. 100, Las Vegas, NV 89101, 702-473-9523. Asian-themed Lucky Dragon Hotel and Casino Las Vegas, after recently celebrating its one-year anniversary, has closed its gaming and all of its restaurants. The closure includes Dragon’s Alley, Pearl Ocean, Phoenix, Bao Now and Cha Garden. After 16 years at Palms, Alizé at the Top of the Palms, the French restaurant founded by chef André Rochat, closed after service on New Year’s Eve. Rochat’s Andre’s at the Monte Carlo closed in October of 2016 as part of the resort’s transition into Park MGM and to make way for Eataly. Andre’s Bistro & Bar at Fort Apache Rd. and Patrick Ln. will remain open. Alizé at the Top of the Palms, Palms Casino Resort, 4321 W. Flamingo Rd., Las Vegas, NV 89103, no phone. Emeril Lagasse’s Table 10 at the Grand Canal Shoppes within The Palazzo Resort Hotel Casino closed after service on New Year’s Eve, as the restaurant opted not to resign its lease. Lagasse opened the restaurant in 2007 when The Palazzo opened and named it for the table where he did most of his business when he was planning his first restaurant in New Orleans. Lagasse still has three restaurants in Las Vegas: Delmonico Steakhouse at The Venetian; Lagasse’s Stadium at The Palazzo; and Emeril’s New Orleans Fish House at MGM Grand Hotel & Casino. The Palazzo has not yet announced a replacement for Table 10. Table 10, The Palazzo Resort Hotel Casino, The Shoppes at The Palazzo, 3327 Las Vegas Blvd. S., Las Vegas, NV 89109, no phone. After being open since 1998, the classic steak and seafood restaurant McCormick & Schmick’s at Hughes Center closed unexpectedly on September 23 and within days was transitioned to a Claim Jumper by Landry’s Inc., owner of both restaurants. Now only three months later, this new Claim Jumper has shuttered. Three of the family-friendly casual concept chain restaurants remain open in Southern Nevada: one on the westside at 1100 S. Fort Apache Road; in Henderson at 601 N. Green Valley Parkway; and the 24-hour location inside the Golden Nugget in Downtown Las Vegas. Claim Jumper, The Row at Hughes Center, 335 Hughes Center Dr., Las Vegas, NV 89169, no phone.